In our research programme we will apply a broad view on health. 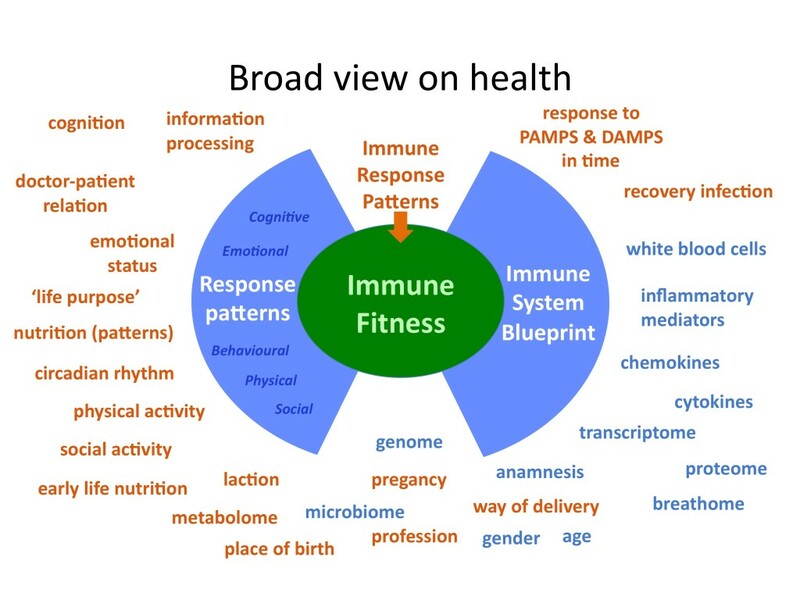 As is depicted below in the blue area on the left, we will take into account psychosocial determinants for immune fitness. There are strong leads that these elements are related to immune fitness. We also take into account the ‘immunological blueprint’ that is established during the first 2 to 4 years of your life, which consists of for instance the genome and specific early life events such as way of birth. Combined with how immune biomarkers respond to immune stimulants, all these elements together can be a measure of immune fitness. The method we will use to be able to take into account the complexity of this domain, is called complex adaptive systems theory.